It´s been a while since I blogged. A lot´s been happening. There was the great inaugural Flash Fiction Festival in Bath at the end of June which, apart from some super workshops with Kit de Waal and Tania Hershman, also allowed me to catch up with a dear friend of the Possum´s in Bristol and spend time with a writing friend and her husband in a lovely Bath B&B. Early September, I heard that a story that had been rejected in the UK will appear in a bilingual German/English anthology – this project has been in the works for a while, but looks like it will eventually come through. 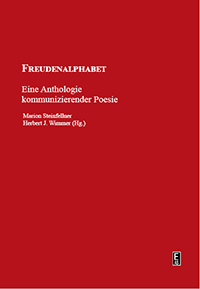 Another project that has been ticking along and has now borne fruit is Freudenalphabet, a German-language anthology including my work in English. And then there’s the Stories for Homes #2 anthology to be launched as an ebook on 28 September, with the print issue following in November. So do support it, as funds will go to support the UK housing charity, Shelter. November will also see the publication in Australia of the IP 20th Anniversary anthology, Just Off Message. I´m particularly pleased about the inclusion of two of my stories in the anthology, firstly because IP published my story collection Back Burning back in 2007 – it won IP´s Best Fiction award for that year – and secondly, since I feel the two stories, “Anna´s Flags” and “Eucalyptus”, originally published in two anthologies of the International Short Story Conferences, have now escaped to a home in Australia. I´m currently doing some political writing in German in an online workshop led by Julya Rabinowich for the Vienna Poetry School and was happy to connect in real life with her and some former students tonight. I´m looking forward to doing a workshop there with Ju Pfeifer end October/early November. It will be on idiocy and resistance, which is somehow appropriate for me these days. And there´s still work to do on my opus revision, my body and my health. So since it´s the beginning of a new term, I now have an exercise routine with the gym and swimming and walking. This all clears my head. After having ditched Facebook a year before I quit smoking, and now, more than a year since King Fag left me, it seemed appropriate to go another cold turkey and ditch Linky Ding and a Twitter reigned by various national emanations of the incredible Rumpasaurus effigy. So much to do. So little time. So, until next, onwards! Posted in: Blog. Tags: Bath Flash Fiction Festival, Freudenalphabet, Judith Nika Pfeifer, Julya Rabinowich, Kirstin Zhang, Living in Vienna, Stories for Homes #2, Vienna Poetry School.